This fabulous image of Kilda Northcott as Demeter, in the2005 spectacular Demeter’s Dark Ride – An Attraction, is featured on the cover of issue 70 of Australian Drama Studies. It accompanies the article “A Rare Opportunity to Fail’: STAB’s Legacy of Theatrical Experimentation” by Emma Willis, in which she explores the history of BATS Theatre’s STAB season, since its beginnings in 1995. STAB continues to be a great opportunity for theatre makers, and many Magdalenas have particpated over the years. As well as discussing Demeter’s Dark Ride, Emma mentions Jo Randerson and Trouble’s The Lead Wait (1997) and Helen Varley Jamieson’s the[abs]experiment (2001). Overall the article provides a comprehensive review of 21 years of STAB seasons. Demeter’s Dark Ride – an attraction was directed by Madeline McNamara and involved most of the Magdalena Aotearoa team in some way or other. 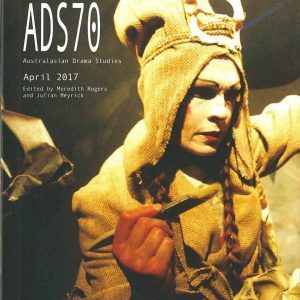 You can purchase a copy of Australia Drama Studies here.